In my family, we call this game Basta, but it many names. It is called Tutti frutti, ¡Mercadito!, Stop, Lápiz quieto, Animales con E, Alto el fuego, or Ensalada rusa, depending on the country. 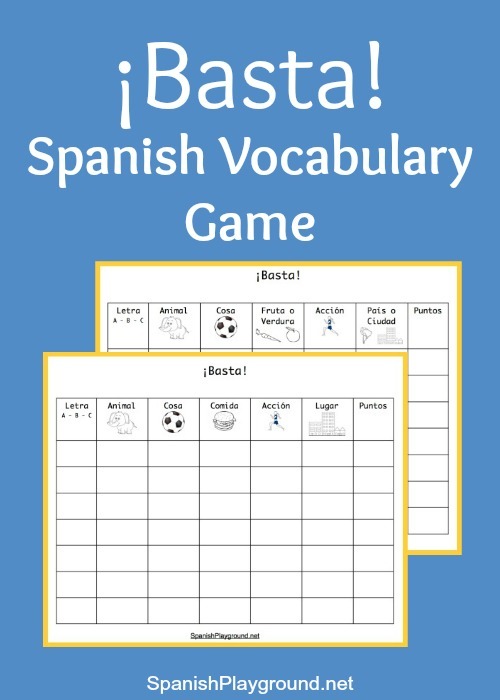 A Basta game is fun Spanish vocabulary practice as players think of words in categories that begin with a certain letter. I love that you can play Basta with just a pencil and paper for each player. You can also print Basta game boards, like mine below, but it’s not necessary. Players can easily make their own. Of course, other printable Spanish vocabulary games have the advantage of using pictures to support the language. Buscando por la casa and Encuentra los animales are printable picture-based games. You can also find a list of Spanish vocabulary games to play with picture cards here and 13 sets of pictures cards in the post about Spanish listening games. To play, everyone makes a Basta game board. Common categories include nombre, cosa, animal, fruta o verdura, color, país o ciudad and apellido. Categories can be anything though, including pop culture references like marca, música, famosos/as. When I play Basta with kids learning Spanish, I usually include verbo or acción as a category. You can see my simple Basta game board in the image below. You can also download it and a slightly harder Basta game board at the end of the post. In the slightly harder version, a couple of the categories are more specific. Basta is so common and popular, that you can find many lists of words for different categories online. For example, you can find lists of colors for every letter of the alphabet, and of fruits and vegetables that start with i, q, o, r, k, t, ñ, x, y, z, w. Repeated answers are worth fewer points, so kids who play a lot memorize unusual answers for different letters in each category. This information gap game is another fun way to practice Spanish vocabulary. It is not a category game, but often we often play it with picture cards in a category. You can play Basta in different ways. This is how we play, but you can adapt your Basta game for different ages and language levels. To play, players select a letter this way: one person says the alphabet very quickly and someone else stops her by saying basta or ya. Whatever letter the player is saying when she hears basta is the letter for that round. Of course, you can also make a set of letters and draw one or choose a letter using any random method. Everyone writes the letter in the space on the left, and then tries to think of a word for each category that begins with that letter. Play stops when one of the players says basta para mí, basta para todos (or tutti frutti, alto el fuego, stop, etc.). Any player can stop the round this way whenever she likes. You can also use a timer, but that eliminates part of the strategy that is part of a Basta game. To score the round, players read their answers aloud. For an answer that no one else has, a player gets 10 points. For an answer that someone else also has, a player gets 5 points. For no answer or an answer that other players do not accept, a player gets 0 points. Players write the number of points next to each answer and total the points for each letter in the Puntos space at the end. Category games are an excellent way to practice Spanish vocabulary. A Basta game also get players thinking about letter sounds, and stretching their vocabularies so they don’t repeat answers. Because the game is played throughout the Spanish-speaking world, it also has cultural component. 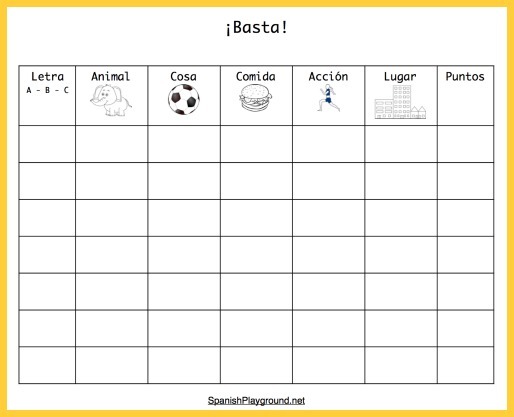 Try Basta with your Spanish learners!